Submitted by Quest-News-Serv... on Sun, 01/25/2009 - 20:34. 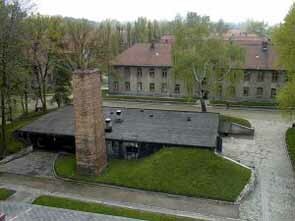 Crematorium I operated [at Auschwitz] from August 15, 1940 until July 1943. According to calculations by the German authorities, 340 corpses could be burned every 24 hours after the installation of the three furnaces. The largest room in this building was designated as a morgue. It was adapted as the first provisional gas chamber in the autumn of 1941. The SS used Zyklon B to kill thousands of Jews upon arrival, as well as several groups of Soviet prisoners of war. Prisoners selected in the hospital as unlikely to recover their health quickly were also killed in the gas chamber. Poles sentenced to death by the German summary court. 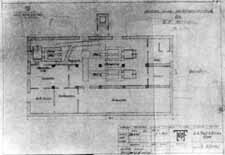 After the establishment in Auschwitz II-Birkenau of two more provisional gas chambers, Bunkers No. 1 and 2 (the so-called "little red house" and "little white house"), the camp authorities shifted the mass murder of the Jews there and gradually stopped using the first gas chamber. After the completion of four crematoria with gas chambers in Auschwitz II-Birkenau, the burning of corpses in Crematorium I was halted. The building was used for storage, and then designated as an SS air-raid shelter. The furnaces, chimney, and some of the walls were demolished, and the openings in the roof through which the SS poured Zyklon B were plastered. After the war, the Museum carried out a partial reconstruction. The chimney and two incinerators were rebuilt using original components, as were and several of the openings in the gas chamber roof. Animal Law Coalition is an organization committed to stopping animal cruelty and helping states and communities find humane solutions to safety, nuisance and other animal-related issues. 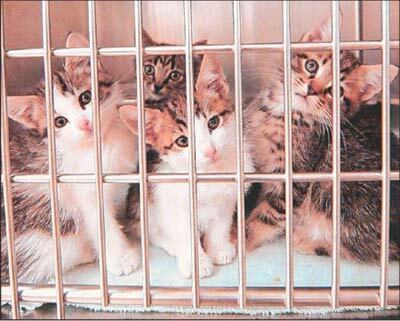 On behalf of Animal Law Coalition's North Carolina members, we endorse and urge your support of the Humane Euthanasia in Shelters Act, to be introduced to the General Assembly in January, 2009.